hey everybody how’re ya doin’? 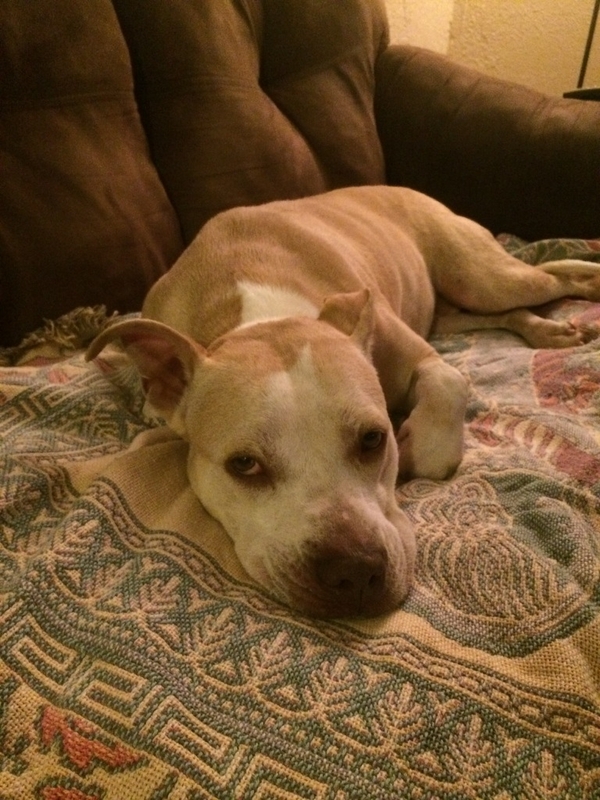 we got an update about Aster today an’ she’s doin’ great with her new family. she’s made some new doggy friends an’ has an awesome doggy gram-ma an’ gran-pa. her gran-pa set up a sprinkler for her so she could play with the water. 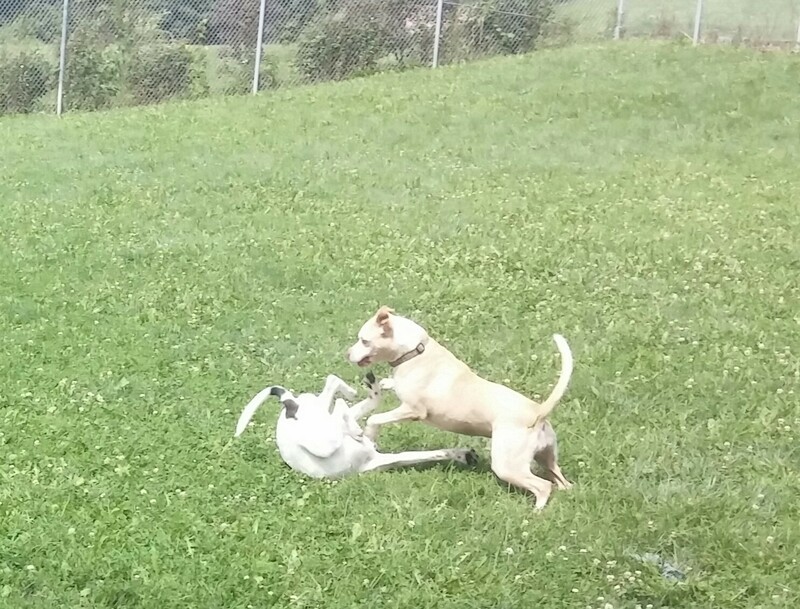 Aster’s mom sent a short video of her playin’ in the water…an’ she looks like she’s havin’ a great time! that’s so cool she has a real nice human family. i hope i’m as lucky as she is when i go to a forever home. i’d LOVE to have a doggy brother or sister to play with and a fenced yard to run ’round in, an’ maybe even a kiddy pool or sprinkler! but, til my future human family finds me, i’m cool here cuz there’s lots to do and see, an’ our humans take real good care of us and love us and give us lots and lots of attention. plus, we get to see volunteers, too, an’ they’re great, too. i’ve got some new stuff goin’ on with me i wanted to talk ’bout. first, i gotta go to some oh-bee-dee-nce classes a lil while ago. our humans are always workin’ on stuff to make our lives here great, so they’re teachin’ us doggies stuff like how to “sit”, an’ “lay down”, an’ to “leave it”. i learned stuff real fast, and made Jana (she was the human workin’ with me) real proud of me… an’ Pete an’ Christine, too. i like learnin’ new things an’ makin’ humans smile at me and tell me i’m so smart, and such a good boy… and i get lots of treats for doin’ a good job! i love treats! anyways, the other news i have is i have a new roommie, Tommy Boy. our humans wanted to move a doggy from the intake area, Radar, out to the main kennel…so Radar is with Nemo, and Tommy Boy’s with me. i like him, too! he makes funny sounds… kinda like a bark and a rooo kinda sound at the same time. he’s goofy an’ lots of fun to play with. he’ll probly be ready for adoption next week, but i dunno how that stuff works… that’s human stuff, what i like is havin’ a good roommie who’s lots of fun to hang out with an’ to run around the yard an’ play with, and he’s snuggly at night. k, i gotta go cuz some new volunteers wanna take me an’ Tommy Boy out in the yard… time for some treats! Bye! 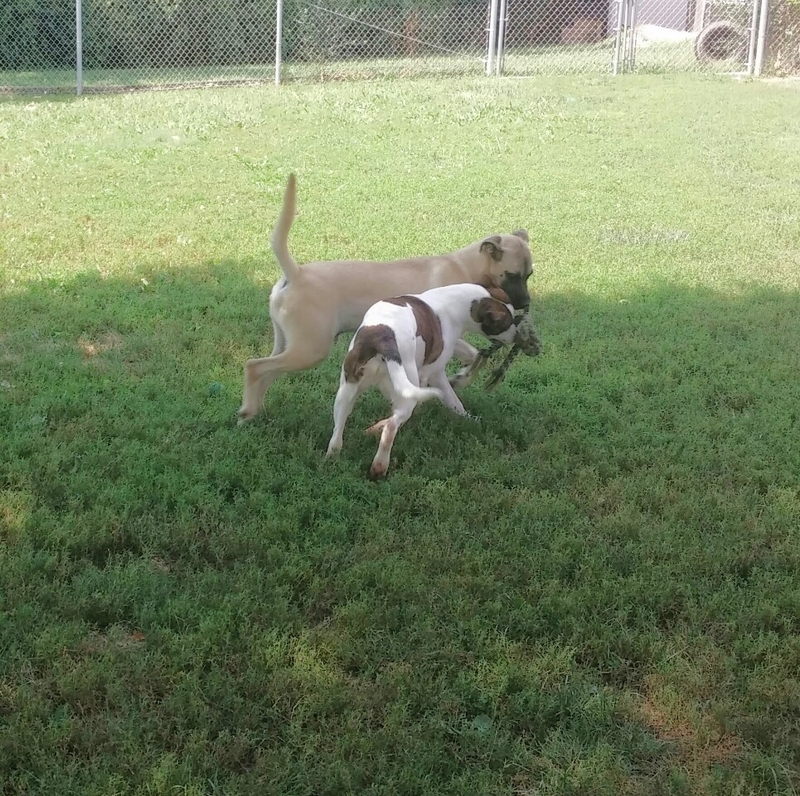 me and Tommy Boy playin’ tug… he’s kinda winning. 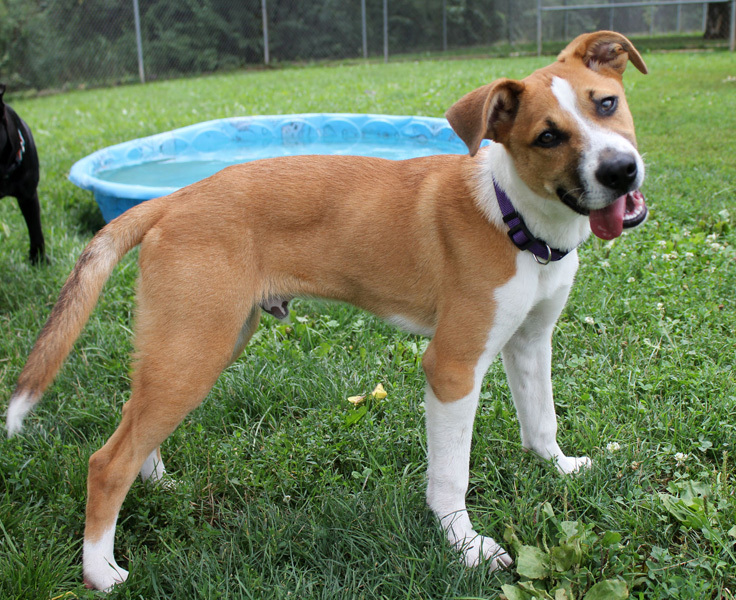 hi… my name is Rukus, an’ i’m a 5-6 month old Collie mix an’ I came in with Snoopy. 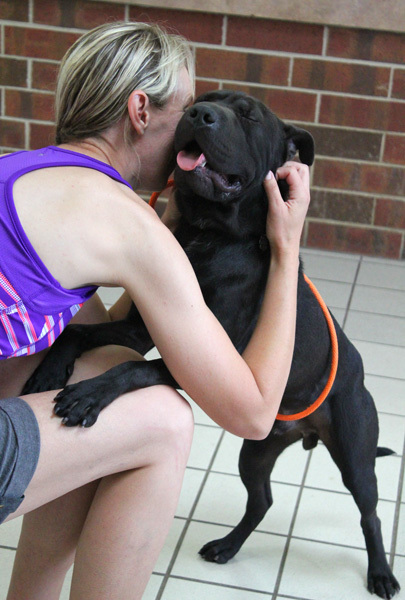 i’m a really sweet guy, an’ love spending time with humans cuz they pet me an’ love on me an’ give me treats! i gotta confess somethin’ tho, i think the reason my name is Rukus is cuz when i came here i had a different name, so when Christine came into the room me an’ Snoopy were in, the first thing i did was bark at her… so she re-named me Rukus (i can’t remember my old name, and i kinda like “Rukus”). i still bark a bit, but that’s just cuz there’s lots an’ lots of stuff goin’ on, an’ i’m still a pup, so i dunno yet how else to act! when i first got here, i was a lil bit shy, but i figured out real quick the humans here are real nice! 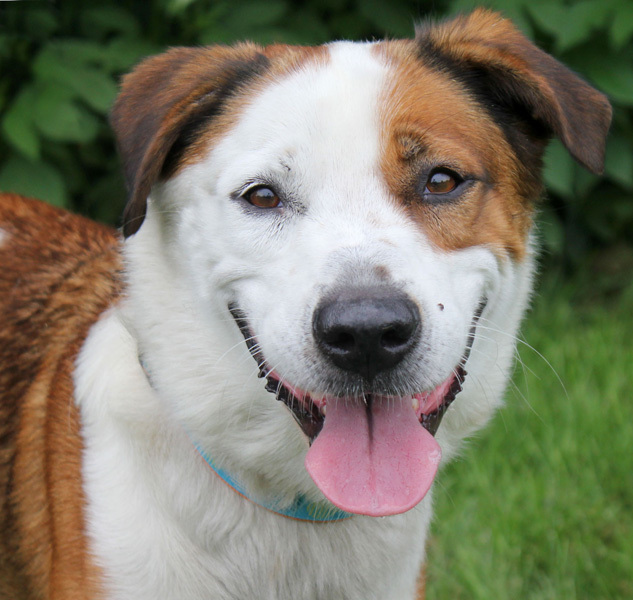 i’m workin’ on bein’ more outgoing like Snoopy is, cuz i wanna find a forever home. i’d love a real home of my own. bein’ in a house for a while was sooooo nice after bein’ out an’ about with Snoopy by ourselves, so i wanna talk ’bout the kinda forever home i’d like. 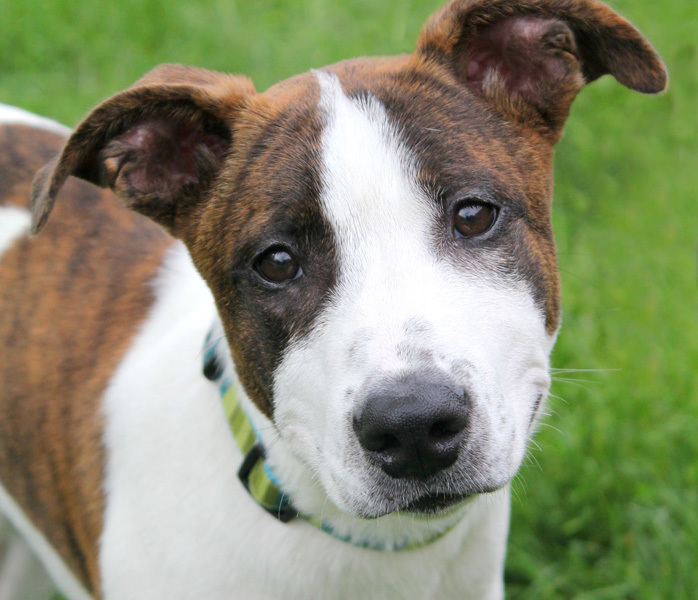 i’m a real nice boy, i walk real easy on a leash, and i like to play with Snoopy an’ other puppies lots… so i’d be VERY happy to go to a home with a doggy brother or sister. and, i’ve got lots of energy, an’ i know after i’ve been in a play group, i’m kinda tired… hey, that’s sneaky of our humans… they put us in play groups so we can run off our energy then we sleep real good at night, an’ sometimes we’re all more quiet in the kennel after play-time… but that’s k cuz i have lots of fun! i heard Denver an’ Dakota get to go to a home together cuz they’re bro’s, but me an’ Snoopy don’t got to go to a home together. i really like other doggies, so i don’t think it’d be too hard to find a good brother or sister for me… but if ya want me an’ Snoopy together, that’s cool too! i haven’t met alot of small humans yet, but cuz i’m me an’ a sweet boy, i’d probly be ok with them. i dunno ’bout cats yet, they look like fun to chase, but i think some humans have “rules” ’bout chasin’ cats… silly rules! anyways, cuz i like runnin’ an’ playin’ so much, i’d love a big yard with a fence, kinda like we have here. i dunno, i think Christine will help find a great match for me cuz that’s what she does. if ya wanna learn more ’bout me, how to adopt me an’ stuff, check out hsgkc.org. k, that’s all i got for now… plus, i’m gettin’ ready to go out an’ play with Snoopy… that’s way more fun than this “blog” thingy! bye!! i’m still a pup but i can keep up with Snoopy! it’s hard to deny that i’m pretty cute! Hey humans, what’s doin? 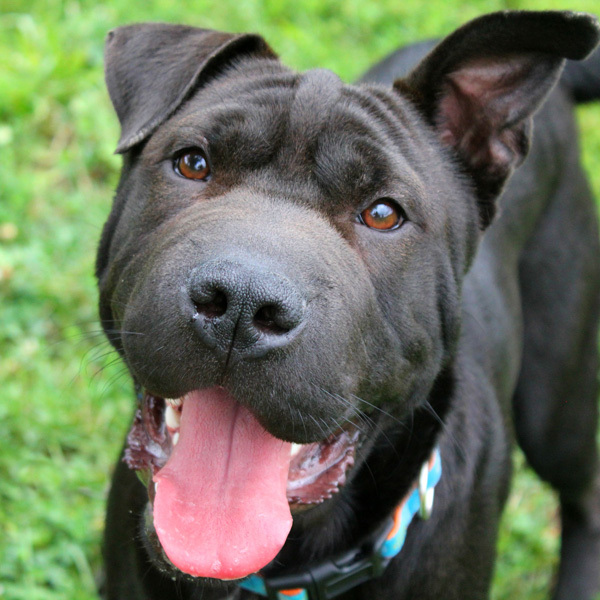 My name is Snoopy and I’m a Shar Pei mix, and I’m ’bout a year old. I ended up here ‘cuz some nice woman found me and my roomie, Rukus, runnin’ ’round as strays, and she kept us ’til they had room for us here. 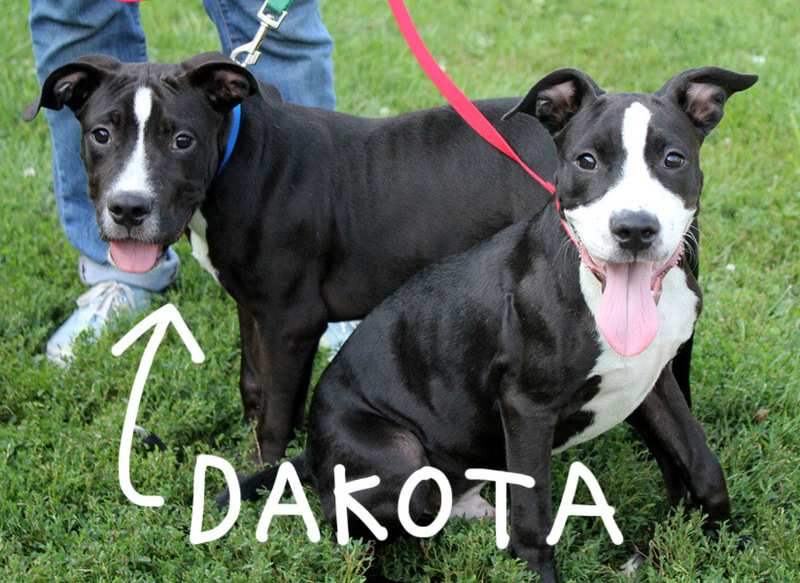 But, we don’t gots to go to a home together like Denver and Dakota. So far, I like bein’ here. There’s lots to see what with all the dogs in the kennel and our humans. They take real good care of us, feedin’ us good food, and making sure we’re healthy. 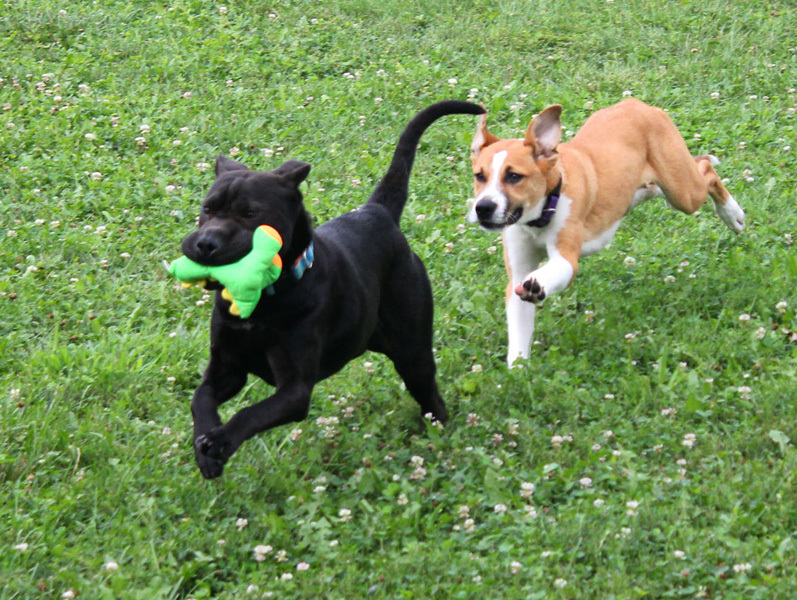 We get to play outside in a big yard and run ’round playin’ (like me and Rukus do cuz we’re roommies), and we get to go on walks, and on Sundays we get to go on longer walks called “Pack Walks”. Last Sunday, Christine walked me, and when we came back inside to cool off for a lil’ bit before goin’ to get breakfast, I gave Christine a hug. She made a big deal ’bout how cute that was, and so did the other humans hangin’ with us, too, like Jana, Valerie, and I think Chuck probly thought it was cute even tho he didn’t say anything’. I’m real gentle like when I give hugs, so I oh so softly climb into their lap and put my head over their shoulder, then the human’ll wrap their arms ’round me and give me kisses on my head. I’m gonna try this on more humans cuz I like gettin’ special attention like that… it’s almost better than treats! Anyways, I wanna talk ’bout the kinda forever home I want, but I’ll wait ’til it’s my turn to blog again. I’ve heard our humans talkin’ ’bout a big event thingy called “Art Unleashed” that’s goin’ on tonight. Hercules was nice enuff to tell me and Rukus ’bout it, even tho i think he told us just so he could show off how smart he is. So the thingy tonight is suposbly cool for humans to go to cuz they can buy stuff called “artwork” and the “money” they spend all goes to HSGKC to help our humans pay for stuff they need to take care of us like they do. I dunno what “money” is either, but I think it’s important… and I don’t wanna ask Hercules anything else to puff up his ego. K, what I’m gettin’ at is you should go ‘cuz if you go and spend money, it helps take care of us. I gots to go, it’s breakfast time!! See ya’! I like to give hugs and get loved on by humans! 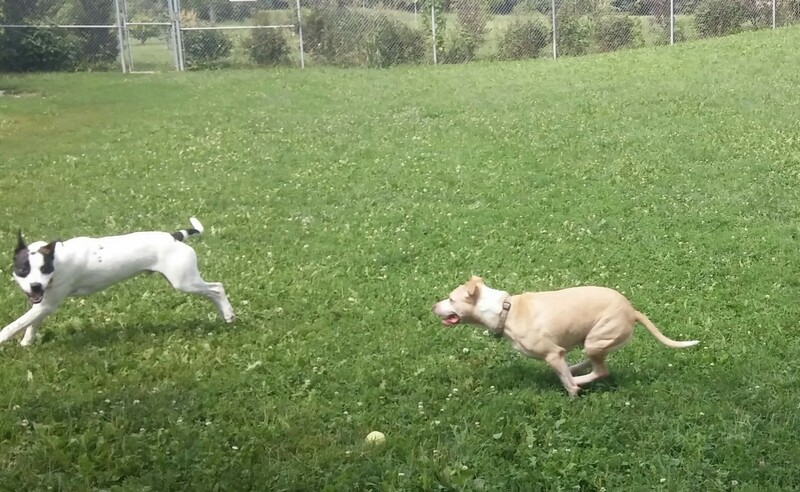 Rukus tries to catch me but I’m too fast! Hey humans, how’s everybody doin? I’m doin’ fine, just chillin’ and keepin’ an eye on all the new dogs and the goings on both in our kennel and with our humans. 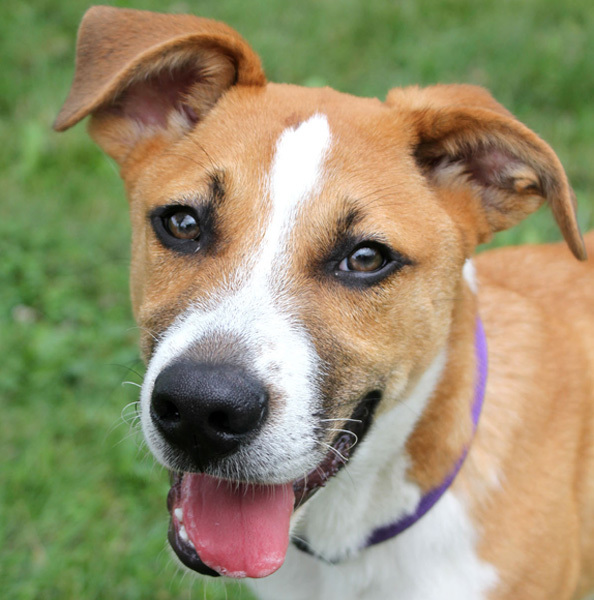 We’ve had lots of dogs and puppies go to their forever homes since the last time I blogged (like Aster, Grizzly, Copper, Robert, and lots of others, but I don’t know all their names) so now there are lots of new dogs here. I like seein’ how the new dogs adapt to life here, and checkin’ out who likes who, who gets a new roommate, and just observing… with all the young pups here someone’s gotta keep an eye on ’em and make sure they’re behaving. Nemo got a new roommate named Radar the other day and so he isn’t in the kennel right next to me anymore (which is fine with me, he’s a nice little dude but some days he’d just get on my last nerve). It’s fun watchin’ Nemo and Radar play together. And of course Dakota and Denver are cute and fun to watch, too, but that’s as close as I wanna be to puppies, I prefer to be entertained watchin’ them from afar. All that young pup energy is too much for a “senior” dog like me. I guess I’m considered a senior now ’cause I’m about 8 years old, but I’m not too old to enjoy short walks and I love goin’ out in the yard and rolling ’round in the grass when I get hot, then gettin’ in the kiddy pool to cool off for a bit… which feels great. Anyways, our humans are gettin’ ready for another big event and fundraiser called Art Unleashed. You can still buy tickets if you wanna go and I’ve heard it’s fun for humans, and whatever money they raise goes back to our shelter to help take care of us while we’re waiting for our forever homes. So, you should go ’cause it helps our humans take care of us. Hey, how ya’ll doin? I’ve had some exciting things goin’ on the past month or so, like I gotta stay with Pete overnight and Bart, now Hogan, came in for a visit to see me on Saturday. Lemme tell ya ’bout how I got to spend the night at Pete’s house first. See, what had happened was I was runnin’ ’round the yard playin’ with Ella, and some kinda bug stung me and I had a really bad reaction to it and went into “shock” or somethin’. Pete, Kate, and the dog doctors here, they’re called veterinarians I think, were real worried ’bout me, so Pete took me to VCA Mission MedVet. The vets there gave me a shot and some other stuff to make me feel better, but they wanted me to stay with someone overnight in case I wasn’t doin’ good… so Pete took me home with him! It was AWESOME! I gotta hang out with him, lay on soft stuff like his couch and a doggy bed. Plus, I got to be the center of attention all night! I dunno what got me, and even though it was kinda scary, I got to hang with Pete… so not a bad deal for me. He’s my favorite human here, besides Chuck, of course… when Chuck’s here, I give him ALL of my attention. Like if I know he’s here, and I’m out in the yard with Ella, I’ll hop right over the fence and run back into my kennel to wait for him to take me out for a walk (kinda cool trick I can do, huh?). Me chillin’ on Pete’s couch. I’m fine now, just gotta watch out for bugs that might sting me… I dunno what they look like, but I know our humans are keepin’ a close eye on me ’cause they love me! 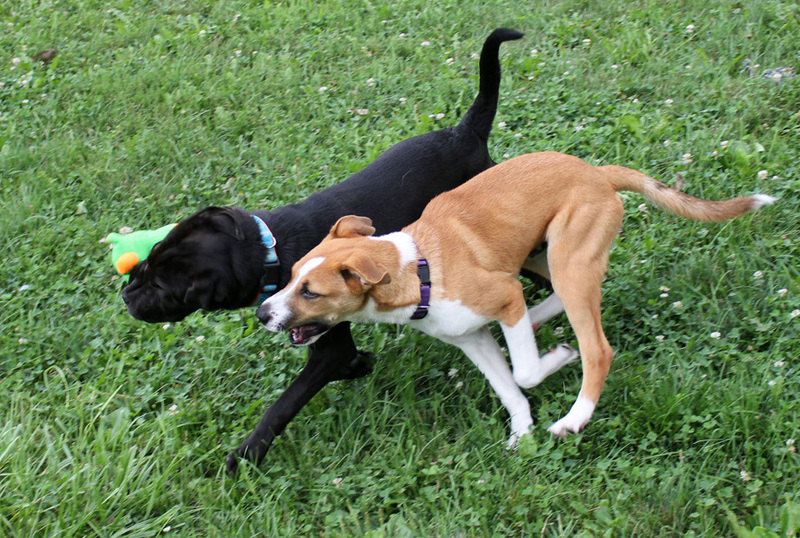 Anyways, Hogan came in on Saturday and his mom and dad wanted to see me and him run ’round the yard and play together. He’s grown up and gotten pretty big, but I remembered him right away. We had fun runnin’ round and wrestlin’, and then I made our humans (and his mom and dad) smile and laugh ’cause I kept jumpin’ in the kiddy pool to cool off. I love bein’ with humans, and makin’ them smile and stuff ’cause they always tell me what a good girl I am, and how sweet I am. Hogan’s almost taller than me, and even though he’s younger I can definitely keep up. After Hogan left, Chuck took me and Ella for a long walk, so Saturday was a great day! And Chuck came back in on Sunday and took me and Ella on the Pack Walk, too! That’s all I got for now! Oh, and don’t forget you can still buy tickets for Art Unleashed. We want lots of humans to go and buy artwork ’cause our shelter will get ALL of the proceeds! That’s so cool! Bye for now! Me chasing Hogan, and I caught up, of course! Hello, my name is Dooney. 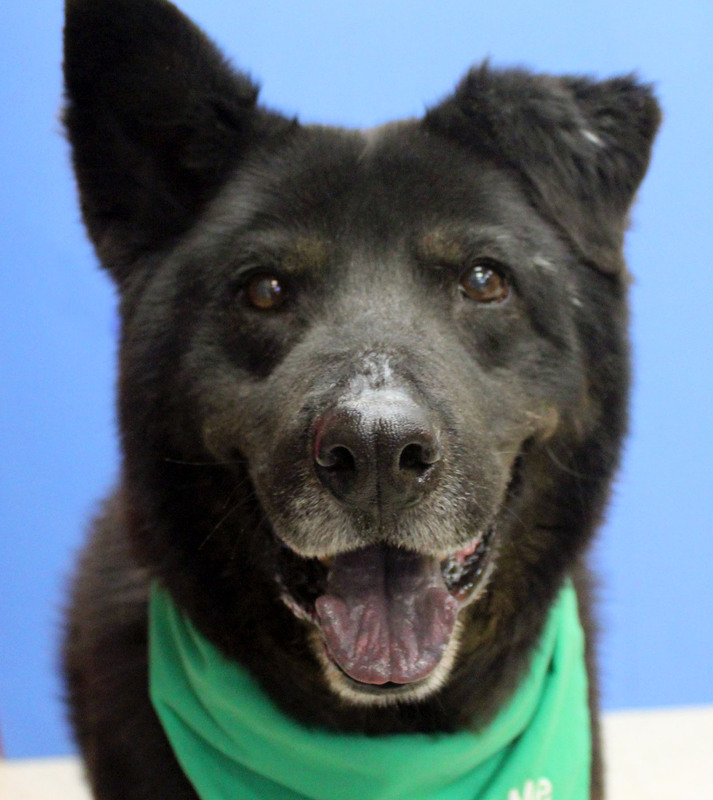 I’m a 5 year old Collie mix who ended up here “cause my former owners had to move out of their home and couldn’t take me with them. I do miss them, they had me from the time I was a real little guy (they had to bottle feed me)… so it took me a while to adjust to life here. I was used to bein’ the only dog so I was the center of attention. 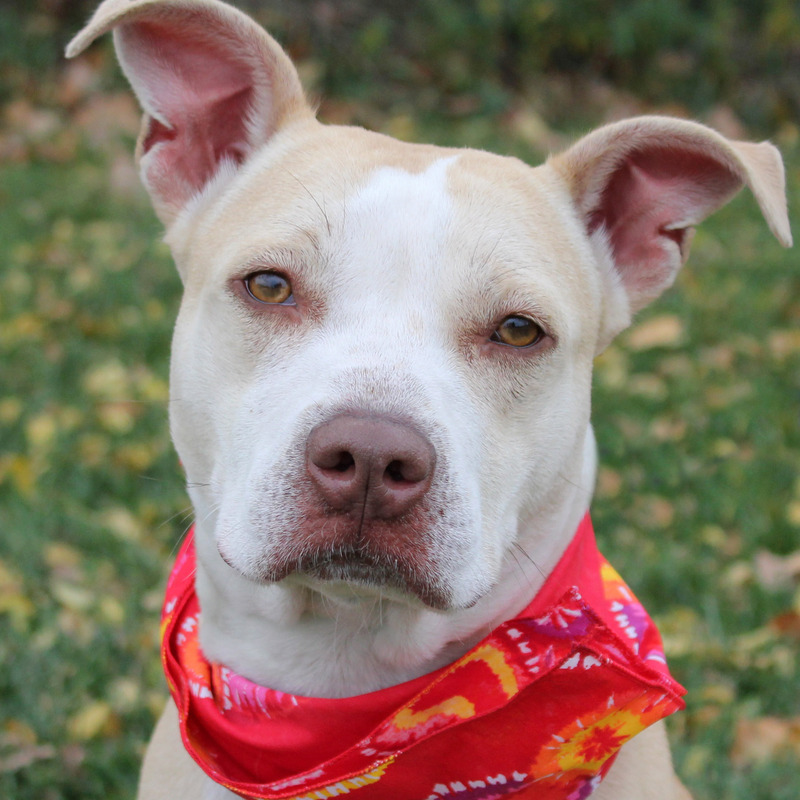 But, I’m glad I ended up here ’cause I’ve heard that even if it takes a while, the dogs here find forever homes. While we’re here waiting for our forever homes our humans are great to us by spendin’ time with us every day, takin’ us on Pack Walks (I love goin’ on walks), and all the volunteers spend time with us, too. We have nice big yards to run around in, with small pools for us to cool off in when it’s really hot. So, even though it’s not a home, these digs aren’t too shabby. 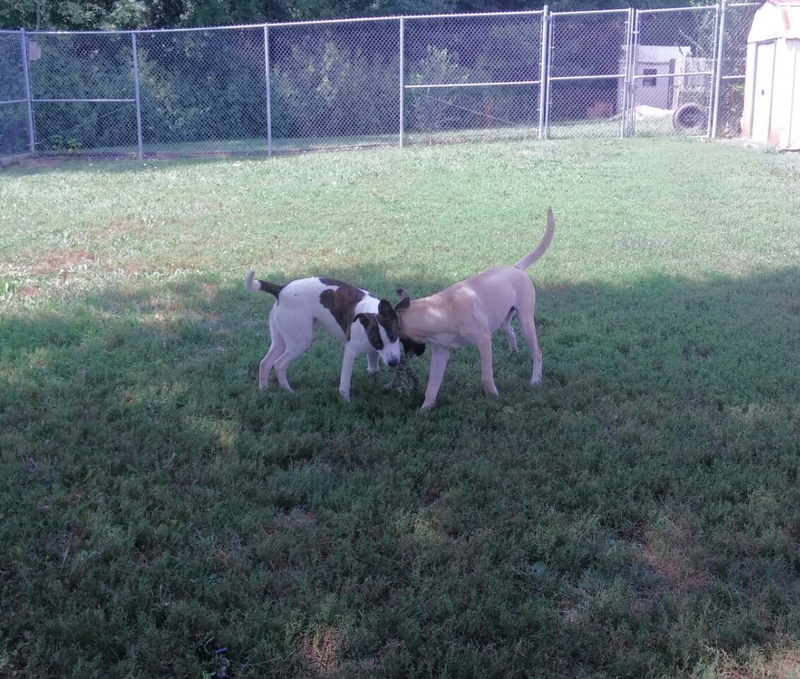 Plus, the other dogs are entertaining to watch… like the puppies and their antics, and sometimes watching the humans is fun, too, like when a dog escapes from them like Shiloh did last week. Personally, I don’t engage in any of the drama, but it’s fun to watch, and there’s always a lot goin’ on here, like Art Unleashed which is coming up this Friday. I’ve heard both the humans and dogs talk about this event and what a big deal it is ’cause it raises a lot of money for the shelter. From what I’ve heard, artists donate art which is displayed at the event and online, and people can then bid on the artwork, and all the proceeds come back to us to help with all the stuff our humans need to run this place. The humans say it’s a lot of fun, but humans and dogs have very, very different ideas of “fun”. I enjoy the simpler things in life (like most dogs), like a good meal, long walks, fresh water, and a clean, warm/cool place to sleep. A lot of our humans are busy gettin’ ready for Art Unleashed, but never too busy to take care of us, like yesterday I got to go on the pack walk and the weather was perfect. That’s all I’ve got for now (I’m a bit on the quiet side and still takin’ it all in)… I’ll talk ’bout my ideal forever home another time, plus I’m gettin’ ready to eat breakfast (food vs. blogging… hmmm… food wins!). Bye.